Despite of its lucrative potential, tourism causes many new social problems. This error is easy to understand. 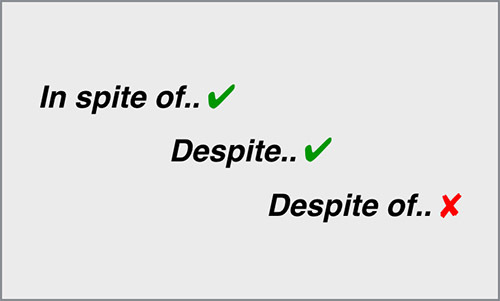 Students see examples of in spite of, which contains spite, and they generalise the same structure to make despite of, perhaps because it also contains spite, has the same number of syllables, and even has the same syllable stress. However, as we all know, English is not always so predictable! In spite of its lucrative potential, tourism causes many new social problems. Despite its lucrative potential, tourism causes many new social problems. Despite containing ‘spite’, ‘despite’ is not followed by ‘of’!